Japanese women love mirrors. They always carry mirror in their bags. The most popular mirror in Japan now is Joyu mirror, wchich has LED lights around it just like theatrical vanities. This mirror is perfect for makeup or tweezing. It’s a foldable compact mirror, so they can put it in their bags just like other compact mirrors. 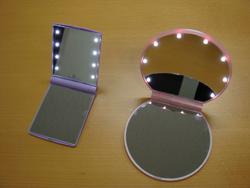 Also, there is Dai-Joyu (Big Actress) mirror, which has amplifier and regular mirror on each side. For the beauty conscious men, there is “men’s Joyu mirror” but I wonder, why can’t they call this mirror “actor’s mirror” so that everyone can use.